Q: Does MTAG want all trucks banned? A: Absolutely not. Trucks are crucial to the functioning of our economy. Trucks that have legitimate business in our communities are welcome, such as trucks delivering to local business and shops. However, port related trucks that are simply short cutting through our residential streets to avoid congestion or tolls on the Bolte Bridge are not welcome. It is these trucks that MTAG wants rerouted away from residential areas. A study by VicRoads and Maribyrnong City Council has found that up to 61% of the trucks on our roads are ‘through trucks’. Q: The trucks were here before the residents so don’t they have a right to use our streets? A: Most of Yarraville’s houses were built around the turn of the century, long before the trucks. Yes industry was here as well, but modern road transport was only introduced in the 1950’s. Prior to this, freight was moved almost entirely by rail. The trucks came long after the houses and use roads never designed for massive modern trucks, particularly today’s double and triple trailers. Q: Where can the trucks go if they are banned from our streets? A: MTAG wants trucks without a local destination to use the Westgate Freeway and CityLink. VicRoads have done studies to show this saves time and fuel even when tolls are considered. Presently, many trucks exit the Westgate Freeway at Williamstown Road to avoid the tolls. MTAG is also campaigning for a truck bypass to be built to give trucks an alternative route to the port through an industrial area. Q: Francis Street, Somerville Road and Moore Street have truck curfews already. Isn’t this enough? A: Francis Street and Somerville Road have night and partial weekend curfews. Somerville Road also has a school crossing curfew and Moore Street has a night and partial weekend curfew with a large exemption zone. The introduction of these curfews are welcome, however MTAG believe this is a band-aid solution. Residents living on other residential truck routes such as Williamstown Road and Buckley Street should have the benefits of night and weekend curfews. Currently, during curfew hours, the trucks just use other residential streets such as Buckley Street. These roads were never designed to carry heavy volumes of trucks and are lined with houses. Moore Street has experienced a 400% increase in night time truck numbers between 2006 and 2013. Whilst it has seen a 40% drop in night time truck numbers since the introduction of the night and weekend curfew in 2015, the continual increase in truck traffic will bring truck numbers back to pre-curfew levels before long. During these curfew hours there is ample capacity on the freeway system. Q: We now have cleaner fuels and tighter emission controls for trucks so what is the health problem? A: The Government introduced new laws in January 2009 to reduce the amount of sulphur in diesel to 10 parts per million (ppm) down from 500 ppm before 2006. New trucks must also meet EuroV emission regulations. However even new trucks still pump out diesel exhaust which the World Health Organisation recently declared causes cancer. There’s no question any more about the negative health impacts of diesel exhaust. With the new standards, diesel exhaust contains even finer particles, which lodge deeper into lungs and can cross into the blood stream. It has been estimated that 50% of trucks using our residential streets are pre-1995, predating any engine emissions standards. These trucks are deemed unsuitable for long haul trips and are ‘retired’ to the major cities for short haul trips. These are the trucks that do the empty container runs between the port and storage yards out west. Q: Why doesn’t Maribyrnong City Council just ban the trucks and container parks from our city? A: VicRoads, and not our Council, control the major roads in our city. Maribyrnong City Council can enforce bans on minor roads and streets, but not the major routes. The same applies for container parks; the council does not have the power to rezone current land use to force containers out of the municipality. Q: It’s only the new yuppies that don’t want the trucks. Why don’t they just move out? A: Whether you have lived here for only one year or for 30 years it doesn’t matter. 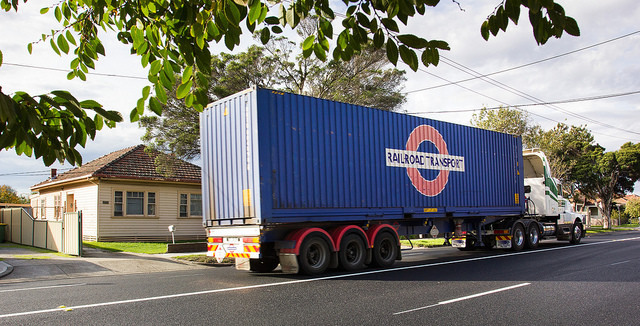 No one should be exposed to the massive number of trucks we experience in Melbourne’s West. Residents here have just as much right to clean air and safe streets as someone living in other parts of Melbourne. The freight being moved through our streets is for the benefit of every Victorian, we should not pay the price with our health. According to VicRoads, over 22,000 trucks use the streets of Maribyrnong every day and these numbers will continue to grow. A recent government report found that children in the City of Maribyrnong were admitted to hospital for asthma and respiratory illness 171% higher than the rest of Australia. This situation is not ok for any child living here. Q: The State Government is building a new container terminal at Webb Dock, won’t this fix the problem? A: No, this new dock is needed to deal with the expected doubling of imports into Melbourne Port over the next 10 years. This new dock will deal with half the expected growth of an additional 2.5 million containers by 2025. Swanston Dock, where the majority of our trucks on our roads originate, will meet the other half of the growth. Without an intervention, we will see truck numbers in the West increase and increase. Q: What does MTAG believe the solution to the problem is? A: There’s no one magic solution. We believe that we need a range of solutions including a truck bypass road, freight on rail with intermodal hubs, more curfews to control the trucks on residential streets and measures to clean up the ageing trucking fleet. Of all the solutions that have been discussed over the years, MTAG believes a truck bypass will deliver the biggest reduction in truck numbers. One million less trucks per year on our streets would be a massive reduction and a big win for the community and the freight industry. However it is critical that any infrastructure solution goes hand in hand with comprehensive truck bans or trucks will continue to use our streets to avoid the tolls. Q: What is the West Gate Tunnel Project? A: The West Gate Tunnel Project is a $6.7 billion toll road that will join the West Gate Freeway with City Link. The project was a ‘market led proposal’ presented to the Andrews Labor Government by toll road company Transurban. It features a tunnel under Yarraville, a new bridge over the Maribyrnong River, an elevated roadway above Footscray Road and major widening of the existing West Gate Freeway between the West Gate Bridge and the Western Ring Road. It will be built by Transurban and primarily financed by tolls on both this road and City Link along with a State Government contribution. Q: Does MTAG support the West Gate Tunnel Project? A: MTAG has not given unconditional support to the West Gate Tunnel Project. We’ve been highly critical all the way. We are incredibly disappointed that the Planning Minister has rejected tunnel filtration, going against the recommendations of his own appointed Planning Panel. In early 2017, Premier Daniel Andrews told MTAG personally that the cost of tunnel filtration would be a ‘drop in the ocean’ compared to the cost of the whole project. We are also outraged that no truck bans will be in place for Williamstown Road, meaning a huge increase in truck numbers for this single lane, residential street. Our support for the West Gate Tunnel Project has always been, and remains, conditional on full truck bans and filtration on the vent stacks. But we also know it has the potential to take thousands of trucks off our streets in less than five years. It is for this reason that MTAG has chosen to advocate for the best possible outcomes for this project, rather than outright protesting against it. We know the trucks are a problem. There is a solution on the table, and we have a chance to make it a good solution. We are taking that chance while we have it. 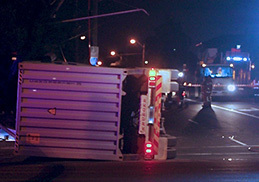 Q: What will the West Gate Tunnel Project mean for trucks in the City of Maribyrnong? A: The West Gate Tunnel Project will take 9,000 trucks a day off residential streets by giving trucks a direct connection from the West Gate Freeway to the Port of Melbourne and City Link. The Government has promised that the project will be supported with 24/7 truck bans on Francis Street in Yarraville, Somerville Road in Kingsville, Moore Street and Buckley Street in Footscray, Hudsons Road in Spotswood and Blackshaws Road in Altona North, bans that are only possible because trucks will have a more reliable and direct connection to the port. The current local truck exemptions for petrol tankers on Francis Street will be removed. The local truck exemptions on Moore Street for container trucks servicing Brooklyn and Tottenham will also be removed. Local trucks will be exempt to all bans but these will be true local trucks doing local business, not container trucks. Q: Isn’t MTAG just pushing the problem onto other communities by providing conditional support for the West Gate Tunnel? A: While MTAG’s focus is – understandably – the City of Maribyrnong, we absolutely do not support moving the truck problem into other residential areas. This is why our submission to the West Gate Tunnel Project’s Environmental Effects Statement process called for additional bans to what was originally proposed, including bans on Hudsons Road in Spotswood and Millers Road in Brooklyn, neither of which are in the City of Maribyrnong. We also understand that just slapping on a ban is not the full answer, but asking for bans puts pressure on the government for all sorts of issues to be addressed, such as the need for a better links to the freeway from industrial areas. It keeps up the pressure and helps to generate the political will to further address what is a very complex problem.